ArcGIS Pro 2.3 is the largest release of ArcGIS Pro to date, featuring more new and updated features than any previous release. Take advantage of the new imagery and remote sensing capabilities in ArcGIS Pro 2.3 to improve your workflows for image visualization and exploitation, analysis, map production, and management. ArcGIS is powered by a scalable and optimal information model for managing large volumes of imagery: the mosaic dataset. ArcGIS Pro 2.3 now enables you to make direct connections to cloud stores and to work with imagery natively as image layers in your project. 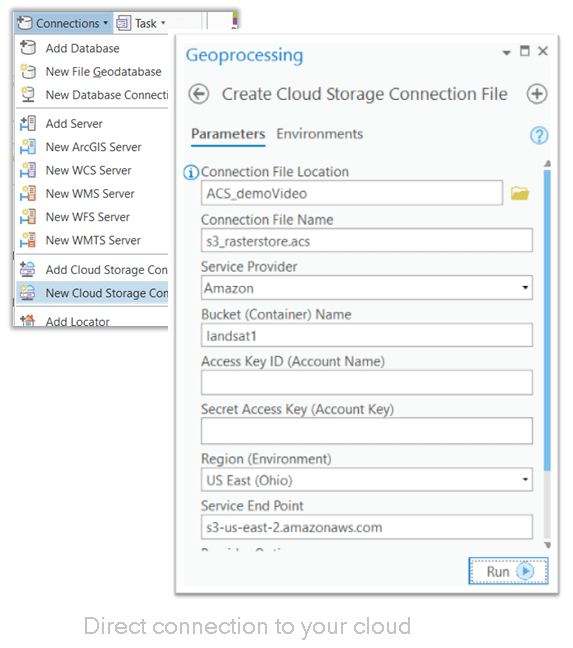 The new ArcGIS Cloud Store connection (ACS) file allows you connect to cloud stores directly, browse buckets/folders and access imagery in your project. AWS, Azure, and Alibaba are the currently supported cloud stores. User experience enhancements improve the way you prepare aerial and scanned imagery for analysis. 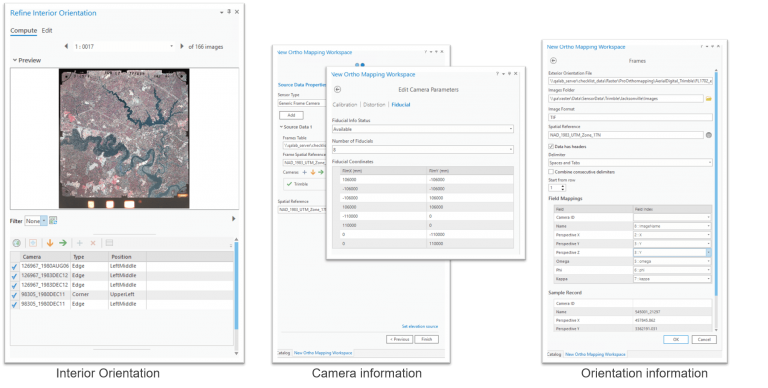 Frame and Camera table generation is now a guided step in the Ortho Mapping Workspace Wizard, as opposed to a manual process. Interior orientation for aerial scanned imagery can now be performed in ArcGIS Pro 2.3, and the UX supports multiple fiducial templates, which come in handy when you have varying quality of fiducials across the image. 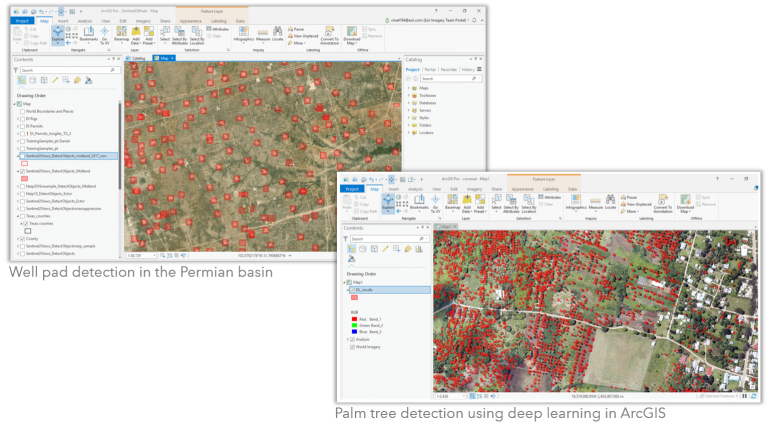 For years, ArcGIS has enabled you to classify remote sensing imagery using statistical and machine learning classification methods. Enhancing these capabilities at 2.3, we introduce the Deep Learning toolset, which enables you to incorporate deep learning models directly into your GIS workflows. Object detection and pixel classification tasks are now supported with three new geoprocessing tools that use deep learning models generated by popular deep learning frameworks. ArcGIS Pro now supports popular deep learning frameworks including TensorFlow, CNTK and Keras. 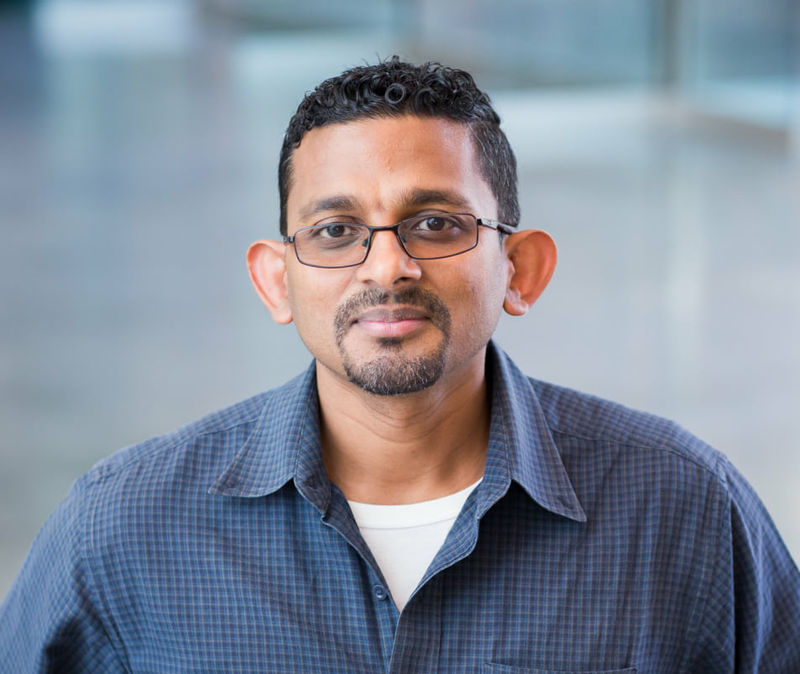 Updates to the Export Training Data For Deep Learning geoprocessing tool simplify the creation of training samples and metadata for input to deep learning frameworks. Motion Imagery, added in ArcGIS Pro 2.3, is the evolution of the Full Motion Video (FMV) add-In for ArcMap. Motion Imagery enables you to manage and interact with video that has embedded geospatial metadata. At 2.3, you can create and edit features in the video player and update existing feature classes, display GIS layers (e.g. building polygons, hydrology features, etc.) in the video player and the map view, and extract metadata from both live video feeds and archived videos. Most of the functionality available in the FMV add-in for ArcMap is now fully integrated into Pro 2.3. FMV now takes advantage of ArcGIS Pro’s powerful architecture, 3D scenes, asynchronous processing, smoother video playback, and better performance. Get an overview of what’s new in ArcGIS Pro 2.3 in general. Learn more about the Image Analyst extension and how to get it. Learn how to get started with the Image Analyst extension.